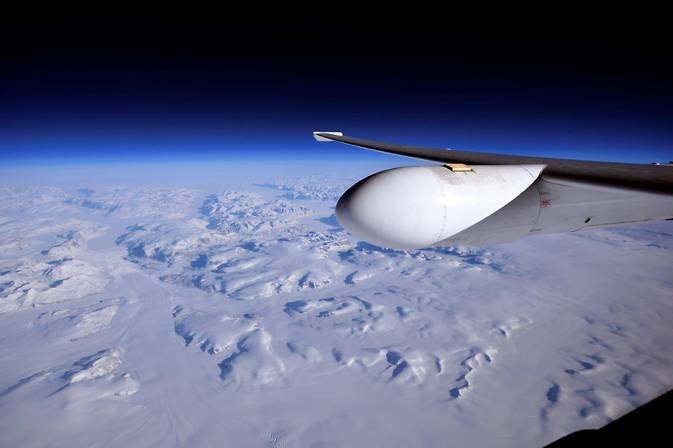 April 17, 2015 – NASA’s high-altitude ER-2 aircraft completed a series of validation flights last month in support of the Earth-observing NASA/NOAA Suomi National Polar-orbiting Partnership satellite, or Suomi NPP. The campaign was jointly sponsored by NASA and NOAA and based out of Keflavik, Iceland conducting science flights between March 7 to 31, 2015. The mission primarily addressed characterizing Suomi NPP’s Cross-track Infrared Sounder (CrIS), Aqua’s Atmospheric Infrared Sounder (AIRS), and the MetOp-A and MetOp-B Infrared Atmospheric Sounding Interferometer (IASI) instruments’ absolute and relative performance in observing extremely cold scenes. The mission also sought to improve geophysical parameter retrieval performance for such challenging polar atmospheres as well as provide anchor points for future numerical weather prediction (NWP) data assimilation studies using satellite data. ER-2 calibration flights were timed to fly directly under the path of Suomi NPP. These same aircraft flight profiles were defined to also obtain simultaneous aircraft measurements parallel with the NASA Aqua satellite, which gathers information about Earth’s water cycle, and MetOp-A and MetOp-B, two polar-orbiting satellites operated by European Organization for the Exploitation of Meteorological Satellites. The flight profiles not only enable validation but also cross-validation among the platforms. Information from these flights is used to establish the accuracy of Suomi NPP’s measurements. The study also provides comparisons of the information from other satellites to verify the overall accuracy for a multitude of observations ultimately benefiting end-user applications, including those related to weather forecasting and climate models. This information also provides a wealth of input in support of other future scientific studies. NASA’s ER-2 aircraft operates at approximately 70,000 feet, flying above most of the Earth’s atmosphere that enables a measurement perspective closest to that seen by overhead satellites, a critical element in satellite sensor validation. “Experimental field campaigns like this are an essential part of validating satellite measurement systems and aimed at improving observations of the Earth’s atmosphere, clouds, and surface for enabling enhancements in weather prediction, climate monitoring capability, and environmental change detection” said NASA Langley’s lead mission scientist, Dr. Allen Larar. The remote sensing instruments that were flown aboard the ER-2 were: the National Airborne Sounding Testbed Interferometer, or NAST-I, operated by NASA’s Langley Research Center in Hampton, Virginia and the National Airborne Sounding Testbed Microwave, or NAST-M, operated by Massachusetts Institute of Technology Lincoln Laboratory in Lexington, Massachusetts. The Scanning High Resolution Interferometer Sounder, or S-HIS, operated by the University of Wisconsin, Madison and the MODIS/ASTER Airborne Simulator, or MASTER, which was developed for the Advanced Spaceborne Thermal Emission and Reflection Radiometer, or ASTER, and Moderate Resolution Imaging Spectroradiometer, or MODIS, projects, all operated by NASA Ames Research Center, Moffett Field, California. The ER-2 is one of a fleet of modified aircraft that support NASA’s Airborne Science Program under the Science Mission Directorate and is based at NASA’s Armstrong Flight Research Center’s Bldg. 703 in Palmdale, Calif. The Suomi NPP mission is a bridge between NASA’s legacy Earth-observing missions and NOAA’s next-generation Joint Polar Satellite System. Suomi NPP, NOAA’s primary polar orbiting weather satellite, carries groundbreaking new Earth-observing instruments that will fly on the other satellites in the JPSS constellation. The next satellite in the JPSS series, JPSS-1, is scheduled for launch in early 2017.